This book will help everyone who wants to start a business in the digital age. It outlines 10 basic steps for success. Step 1 Look for Ideas to Start a Business! Practical ways to find ideas for running a business. Step 2 Research Your Ideas! Discusses the importance of preparing a marketing plan. Step 3 Find Sources of Marketing Information! Provides details on where to obtain information in order to research a business idea. Step 4 Use the Internet to Conduct Market Research! Shows readers how to use the Internet to conduct their market research. Step 5 Plan for Web Marketing! How to develop a strategy and develop a marketing and e-commerce plan of action. Step 6 Create Your Own Web Site! How to select a domain name and what's involved in hosting a Web site. Step 7 Select Your Web Authoring Software! Discusses some of the factors to take into consideration. Provides detailed reviews of some of the most popular Web authoring programs. Step 8 Select Your E-Commerce Software! Requirements to conduct e-commerce together with detailed reviews of software which can be used. Step 9 Set Up Your Business! How to set up a business; the legal and tax requirements plus a discussion of the advantages of home-based businesses. Step 10 Start Now! A call to action together with sources of further information. 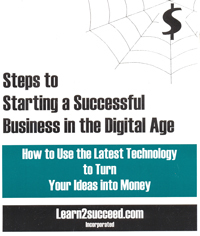 Steps to Starting a Successful Business in the Digital Age: How to Use the Latest Technology to Turn Your Ideas into Money by: Learn2succeed.com Incorporated: softcover; 144 pages; ISBN: 978-1-55270-301-4; published in 2007; $24.95.